Screw gates have been the locking carabiner standard since their inception in the late 1890’s. Auto-lockers entered the climbing scene in the 1970’s but due to their increased weight and somewhat complex operation they have primarily been used by more safety-conscious climbers. Fortunately, auto-locking carabiner design has seen unprecedented change in the last few years. New designs have made them lighter, cheaper, easier to use, and much more accessible to all climbers. For more details watch the video below to see a comparison of how to open a screw gate carabiner versus a standard auto-locking carabiner. A carabiner that ensures safety by locking itself shut after it’s been opened. Until recently auto-locking carabiners have required a series of debatably frustrating twists and pulls to open the gate, and when you release the gate it automatically closes and locks. The actions required to create the safety benefit are the same actions that make these “twist lock” carabiners more challenging to use. The standard twist lock (the auto-locking carabiner in the video above) requires 2-operations (2-stage) and opens with a twist followed by pressure on the gate. Other common names include 2AL, quicklock, Triact-Lock, and 2Lock. The other, more complicated, twist lock type is a 3-operation (3-stage) locker, requiring a pull, a twist, and then pressure on the gate to open. These are also referred to as triple lock, 3Lock, Locksafe, or Auto 3. Climbing gyms that provide pre-rigged GriGri’s (a belay device with assisted braking) will often come equipped with a 3-stage auto-locking carabiner, with the intention of adding as much safety as possible into the system. Ok, so we’ve heard the complaints of normal auto-locking carabiners: too cumbersome to use, and too heavy. But today, there are auto-lockers that are faster, safer, and lighter than the equivalent screw gate carabiner. But there is a slight catch: With these new designs it’s more important than ever to make sure your hand can operate the release mechanism easily (think: getting it off your harness while pumped). Some of the new auto-locking carabiners will take some practice to use one-handed, but it’s totally worth the few minutes of feeling like Edward Banana Hands. Final caveat: since they required a substantial amount of R&D to develop, they come with a higher pricetag than their screw-gate counterparts. 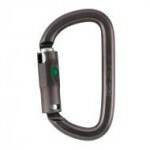 A 2012 debut, the Magnetron series is an auto-locking carabiner that uses magnets instead of a rotating sleeve to lock the gate. Buttons on opposite sides of the carabiner gate are squeezed at the same time to release the magnets and open the gate. Particularly small handed folks will need practice in grabbing the carabiner in an appropriate orientation to be able to reach the lock. The mechanism is fast and easy(ish) to operate in most situations but it does require using a thumb and finger on either side of the gate. The Magnetron series is slightly heavier and significantly more expensive than their screw gate counterparts. The intuitive Slider series of auto-lockers uses a button on the front of the gate that you press slightly and pull down. Some climbers have called the lock mechanism flimsy (perhaps because there is a small amount of side to side play in the button? ), but WeighMyRack testers have been very impressed with how easy the mechanism is to use while climbing and found it easy to open with different hand positions and sizes. The Edelrid Slider series are currently favored by WeighMyRack testers for their ease of use, speed and light weight. 2015 marks the U.S. debut of Grivel’s dual-gate auto-locking carabiners. These ‘biners take some time and humility to get used to; with practice they can become easy to use and faster than any screw gate. Once mastered, these twin gate ‘biners can be used just about anywhere a standard carabiner is used. Expect these auto-lockers to appear in each of the Grivel carabiner body shapes and in wire/wire, wire/solid, and solid/solid gate configurations in the future. Aside: We noticed combinations that include a wire gate are easier to use. The Ergo Wire is an interesting product. It was designed more for adventure parks and via ferrata as the upper lever that locks the gate when it is loaded also prevents wear on the carabiner frame – particularly helpful when the basket of the ‘biner is running on steel cables. Small handed folks will the find the ergonomics are particularly nice. Take note: This is another carabiner that can take some practice to master one-handed operation. A 2015 debut, the Crag HMS Slidelock is a take on the button concept. Each side of the gate has a button that needs to be depressed then pulled down for the gate to open. Like the Magnetron, the Crag HMS Slidelock uses a pinching action but then also a slight pulling action to slide the mechanism down the side of the gate. This requires the carabiner to be held fairly low which may take some time to get used to. This is also quite a large HMS so small hands will need to practice some stretching techniques. One of the earliest designs to try something beyond the pull-and-twist design, was the Ball Lock. Once the button is activated the user still needs to twist the sleeve to open the gate. The twist is necessary to prevent accidental openings because the ball sits proud on the gate, compared to recessed buttons found on more recent designs such as the Magnetron and SlideLock. Update: These Petzl carabiners are no longer produced. You may be able to find some, but they are not readily available anymore. So, how many do you need, if any? Auto-lockers can be used anywhere a locking ‘biner is desired: belay/rappel carabiner, personal anchor, power point, top rope anchors, or mid-rope connection for glacier travel. Unsurprisingly, auto-lockers are often given/recommended to new climbers or guided climbers as they feel safer and it’s impossible to forget to lock it. Zero: Each climber will have their own objections to them. Here are a few: too cumbersome, too heavy, too expensive, or impossible to open one-handed. However, many climbers may be unaware that most of these justifications are quickly becoming obsolete with new designs. One: Auto-lockers are most commonly used as a belay carabiner, increasing the speed and safety at the point of most frequent use of a locker. Two: Belay carabiner and one for a personal anchor. Three: Belay carabiner, two as a top rope anchor. Or belay, personal anchor, and belaying a following climber in guide mode. Or belay, anchor power point, and personal anchor. With the increased speed and ease of use we’ve seen auto-lockers used in critical clip scenarios such as sketchy first draws and long traverses where a fall would be detrimental. Four +: Use ’em anywhere and everywhere you’d like a locker. Some climbers will never use 4 lockers on a climb, but there is no rule against it. Safety conscious climbers that want more redundancy in the system can always find uses for another locker. Any downsides to auto-locking carabiners? 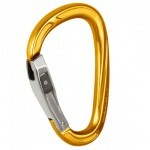 If you have smaller hands and the carabiner is large they can be frustrating to use. One-handed operation will vary depending on the locking mechanism. Although there are affordable auto-lockers (prices start at $11.95), generally screw gates are cheaper (starting at $7.50). Although there are light auto-lockers (the weight starts at 42 grams), generally screw gates are lighter (starting at 37 grams). It can be difficult to quickly identify it is actually locked without pressing on the gate. You may get in the habit of using auto-lockers and forget to lock/check your manual screw gate lockers. Technically, there are fewer options, but 100+ models is still plentiful! It’s all about safety. And time. And mental assurance. There are auto-lockers available now that are reasonably priced, easier and faster to use than the screw gate alternative. So it’s possible to eliminate all the downsides stated above. Unfortunately, I cannot provide the exact model name that fit the needs of every scenario, as this will differ for each climber. If you’d like to know my personal preference, I am a huge fan of Edelrid’s Slider carabiners. I use the Strike Slider HMS as my belay ‘biner and the Pure Slider (tied for 3rd lightest locker) as my personal anchor ‘biner. I was given these carabiners to test and I like them so much I don’t even share them with my life/climbing partner – hands off, buddy. There are now over 100 auto-locking carabiners available which seems like a lot, until you start narrowing it down to your key criteria. If increasing safety and saving time aren’t big enough reasons to jump on the auto-locking bandwagon then stick with screw gates. In our opinion, the only reasons to not investigate the latest auto-lock options would be if they didn’t fit your hands, they didn’t come in your preferred carabiner shape, or they were out of your price range. I expect auto-lockers will only increase in ease of use as they convert to the new standard in safe climbing. And once the market increases we’ll find more price reductions as well. When considering ergo fit, hand size is one thing, but don’t forget the lefties! Many locking (auto or non) ‘biners are asymmetric and don’t operate the same in each hand. I’ve used the Ball Lock for years and love it. I haven’t belayed without it since I watched a rope running over my screw-gate slowly unlock my belay ‘biner — scary! More recently I tried the Elderid slide-lock and found it to work well, and easily, even with gloves on. But, it was almost too easy, and I found it creepy during rappel when I had to be careful that the brake rope didn’t brush the lock. It is nice and light and small though. So, its all condition specific. One more note: if you’re climbing in wet&cold, screw gates are more likely to freeze shut when ice forms in the threads, so the autolockers can help with that issue. PS I’m always looking for small autolockers for my PA and guide mode back loop. Lemme know if you come across any! Great thoughts Meredith, thanks for sharing–I’m glad we have a resident lefty writing in! “…since their inception in the late 1890’s” might need a correction, unless screwgate carabiners have, in fact, been around since the late 1800’s. Hey Brian, thanks for looking out for us! For now, we’re sticking to our story! Locking carabiners were originally used in reference to guns, not climbing, so if we’re talking about climbing-specific lockers the timeline would change, but for locking carabiners in general, the late 1890’s is when they were officially patented. Agreed, Tim. I’ve definitely had more than one instance where I got down from a climb and when the belayer goes to release me realizes that sometime along the way the screw gate had come unlocked. Auto-lockers seem to be a much better solution than just giving eachother a nervous glance and silently vowing to check the gate more often during a climb.